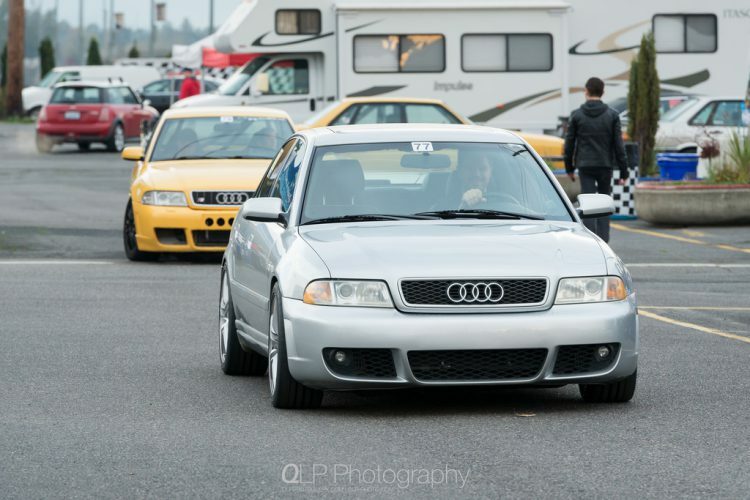 With apologies to Jason Statham in the film “Truth in 24” about Audi’s 2008 24 Hours of LeMans campaign: It almost always rains at Audi Club Northwest’s Quattrofest. 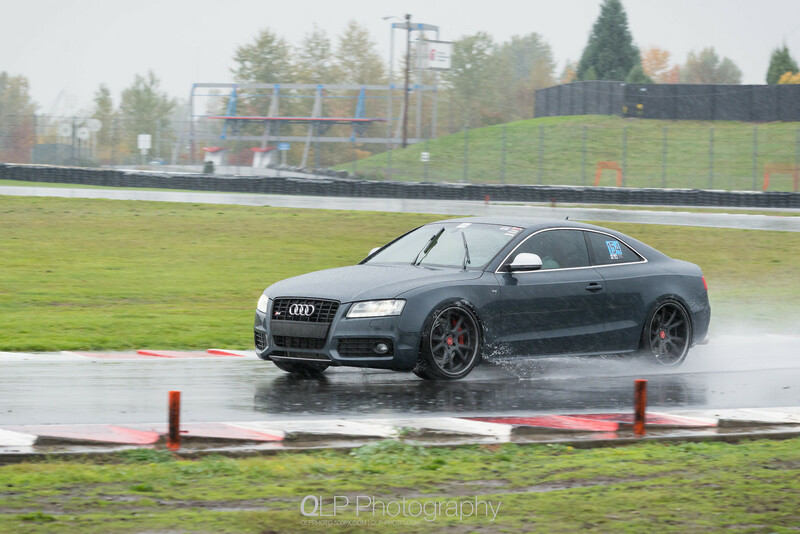 And rain it did at this year’s Quattrofest held on November 7th and 8th at Portland International Raceway (PIR). I worked the event on both days as one of two event photographers and was there both days as gates opened right before 7:00 AM to secure my spot. 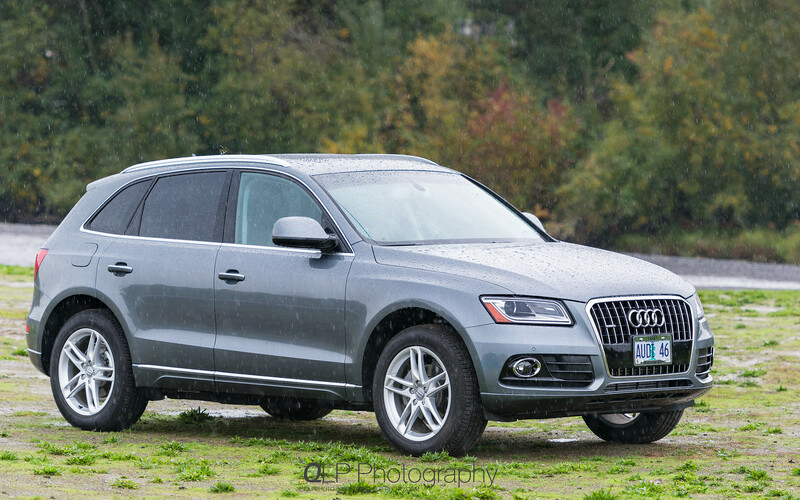 I was graciously loaned an Audi Q5 as a photography support vehicle for the weekend by Audi Wilsonville. But, a bit more on that later. Once I got settled and my photography gear set up, I got my badge for the weekend and started roaming the paddocks. 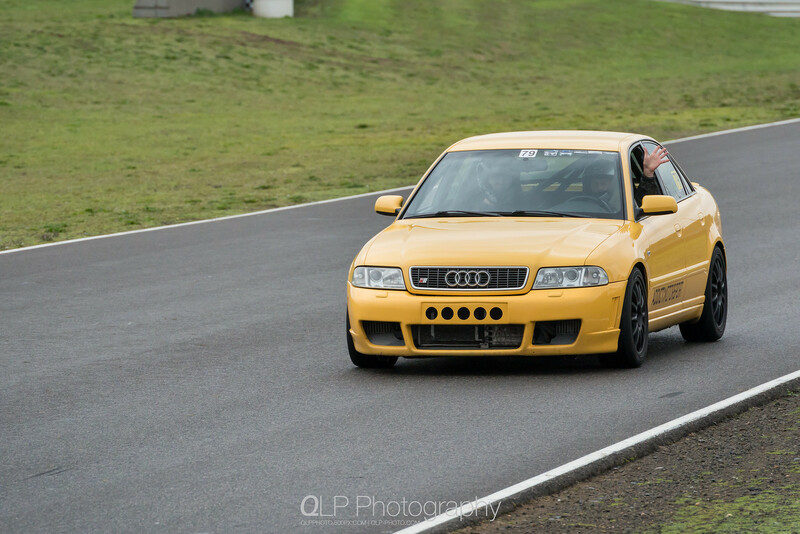 At the start of both days are tech inspections for any cars that will be participating in any of the driving sessions, be it on the main track or as part of the auto-cross and driver skills sessions. For those that got into Portland earlier on Friday, there was also a tech inspection session available that night. After the tech inspection sessions were over and everyone got their registration packet, everyone that was participating in the driver skills sessions headed off for the inner part of the track to start, while those spending the day doing laps went through the drivers’s meeting. 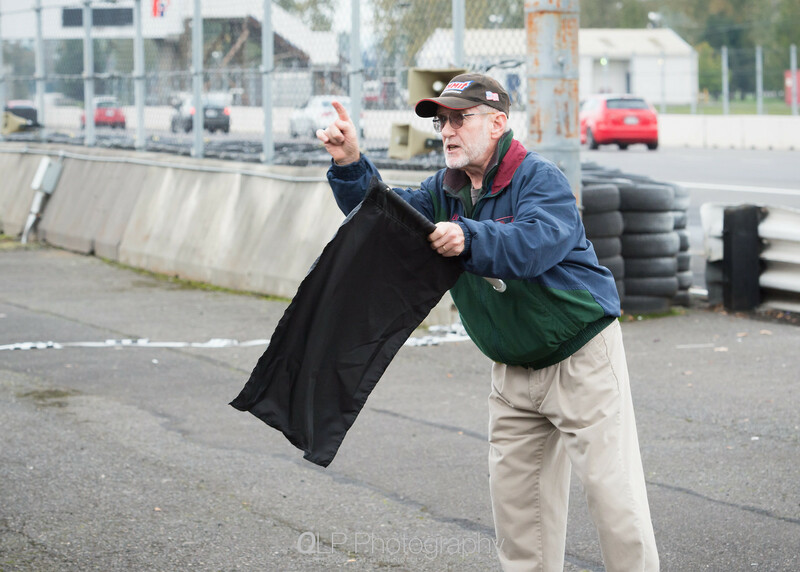 The drivers’s meeting included an run through of the flagging system that was employed to indicate potential issues or problems on the track. 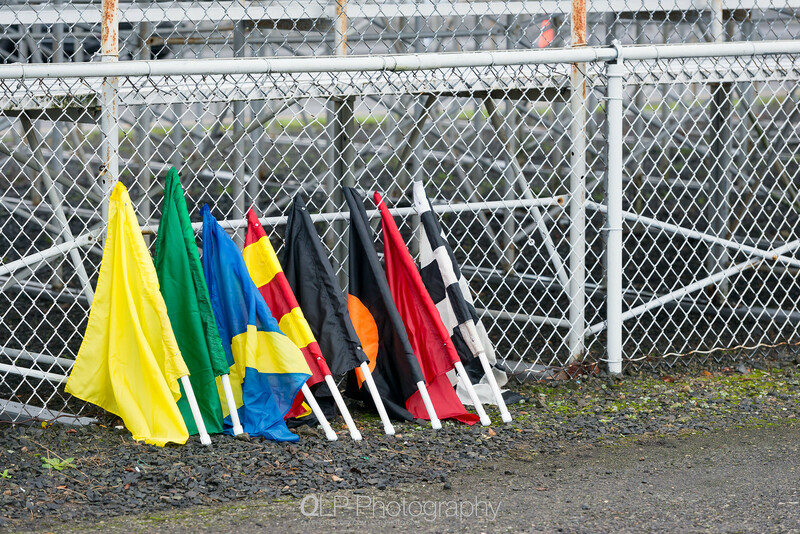 Obviously, you don’t ever want a black flag pointed at you from anyone at the flag stations around the track; much less, ignore a checkered flag and continue lapping around the track as normal (versus acknowledging the flag and then do a cool down lap). After the drivers’s meeting was over, I headed down to the area right before corner #4 and started to take photos from both the nearby flag station and from a couple of the small access holes that dot the fences around the track. 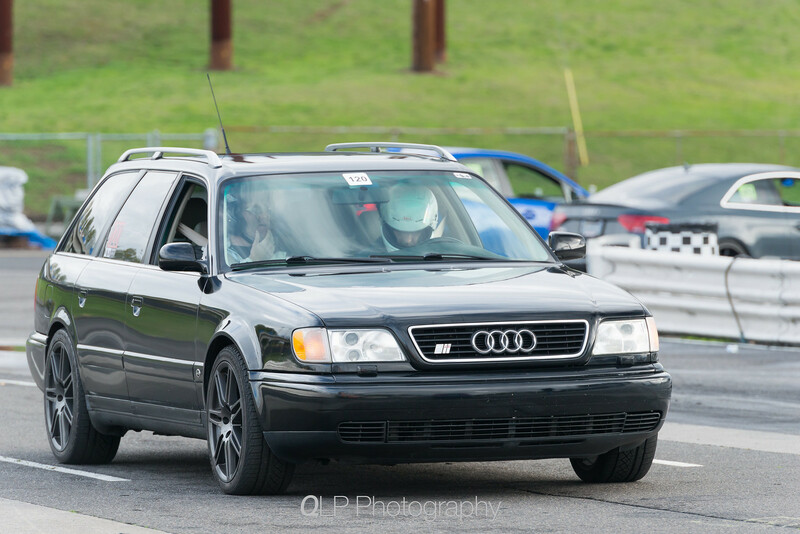 For most of the time I’m taking photos at the track, I am shooting with a Nikon D800E paired up with an AF-S 70-200mm f/2.8 VR II and a 1.4x teleconverter (a TC-14E III that I rented for the event). I also had a D300 with me that served solely as a backup. I also spent a good portion of the day right at corner #12 to take photos of the cars getting ready to zoom on down the main straightaway of the track. Since I could pivot from corner #12 and the staging grid, I was able to take some photos of drivers lining up to start their runs. Since I don’t get to do a lot of panning shots during the year, it took me a little bit of trial and error to start getting results that I wanted. At around 10:15, the skies started to open up the liquid sunshine (note: liquid sunshine in this context means rain, not beer as some in Portland would call it) spigot. It started off as a mild shower, which intensified into a downpour. 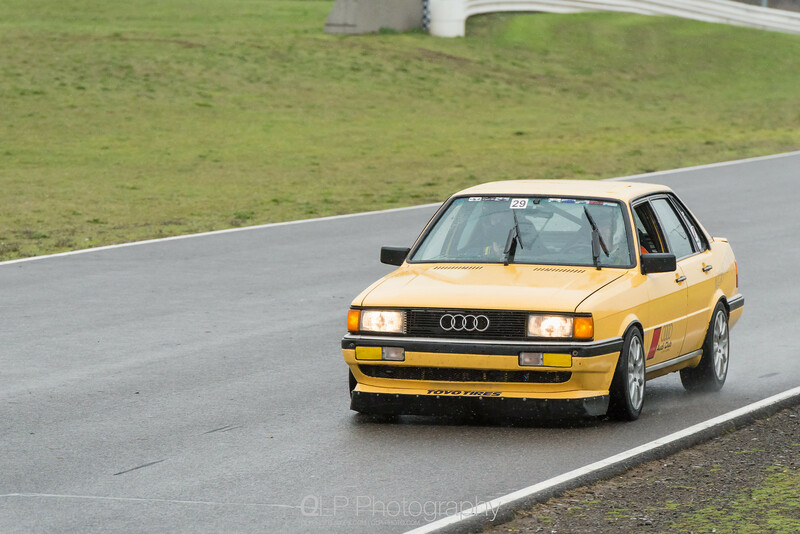 Thankfully, I had rain gear for both myself and my gear; which, allowed me to continue to take photos of cars lapping out on an utterly wet track. The rain continued for much of the afternoon, with a couple of moments of drizzles. I continued to slog it out and taking cover in the Q5 every hour or two to download photos taken, dry things out a little bit and head back out. I may not be a huge fan of crossovers, but the rear hatch provided a much needed shelter when I needed to swap memory cards or other gear on the go. 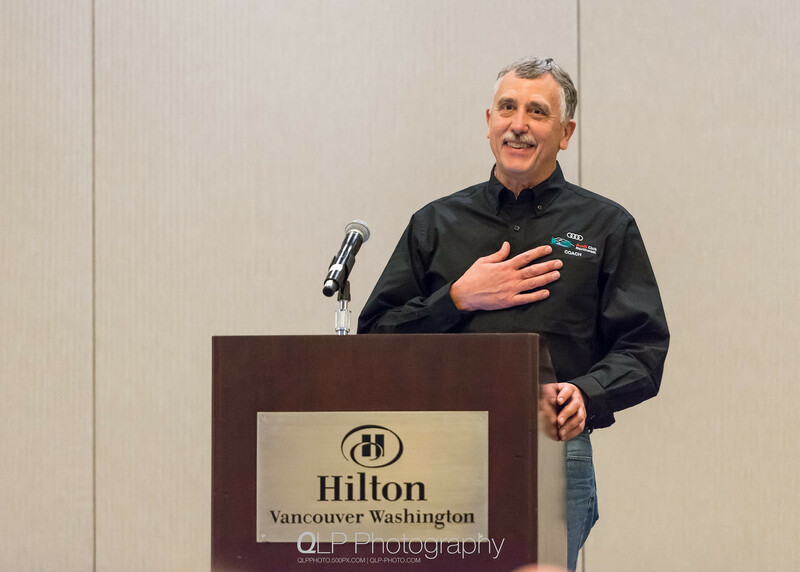 That evening, the club held a banquet at the Hilton in Vancouver, Washington, mere minutes away from the track. For those that got the golden, I mean red, ticket to attend the banquet, there was a delicious catered dinner, drink bar and some petits fours. Set up on the side was a silent auction, in which attendees can bid on several cool items and packages provided by many of the event sponsors. 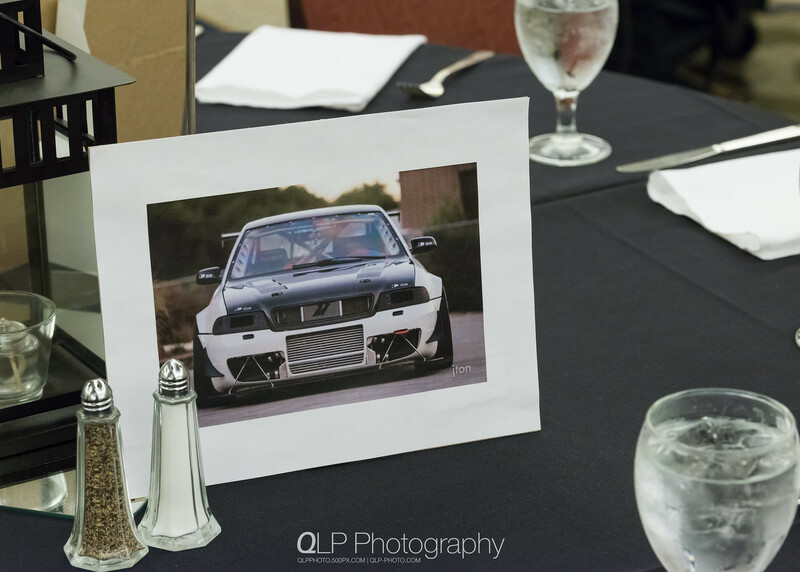 One of the changes made to this year’s banquet was that people were now assigned to tables, but not specific seats, based on the vehicle that they registered for the event. Previously, seats were available general admission-style, with the exception of the special guests and reserved tables. By splitting people up allowed people to meet and chat with new people. 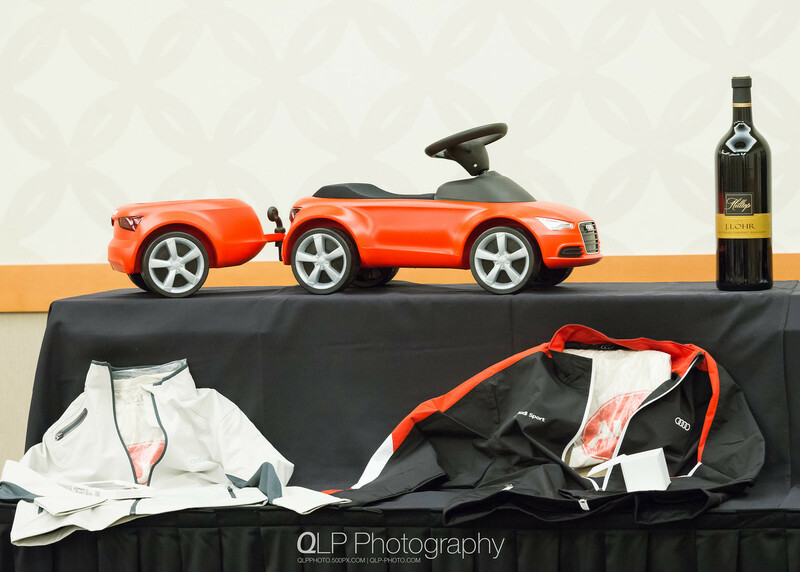 The banquet included a few speakers at the event, including Brad Russell from Audi Beaverton and Christian Paddock from Audi of America to give a State of the Four Rings talk, be it locally or with Audi in general. The topic of the Volkswagen emissions issue came up and Christian made several good points, including that the Audi community should continue to be great Audi brand ambassadors, inform other people when they make or spread incorrect comments and sentiments, and continue to grow and build enthusiasm around the brand. 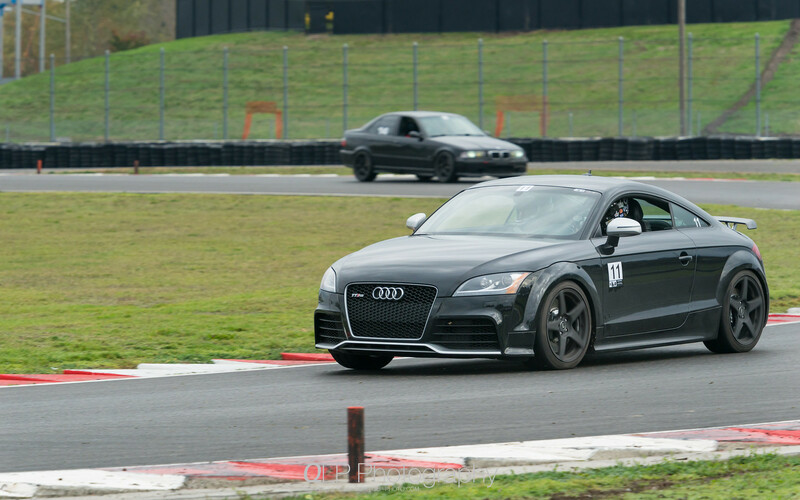 Audi has had to overcome several major hurdles and setbacks in the past (hint: 60 Minutes and unintended acceleration) and has comeback stronger than ever. In fact, Audi continues to see overall sales growth and will continue to invest in developing new innovations and models. 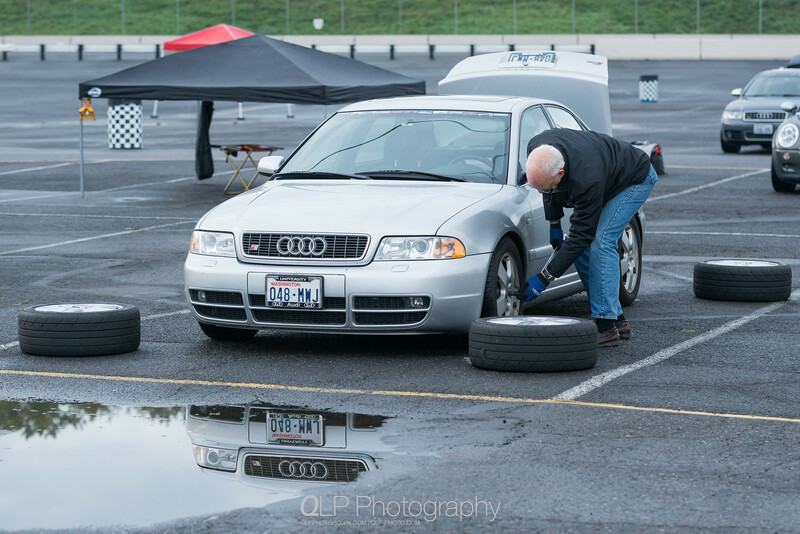 There was also a special Audi Club member recognized at the banquet, John Ewald, who was bestowed the honor of being the 2015 Audi Club of North America member of the year. John was absolutely humbled by the honor and by the huge amount of appreciation and respect shown by the everyone at the banquet. 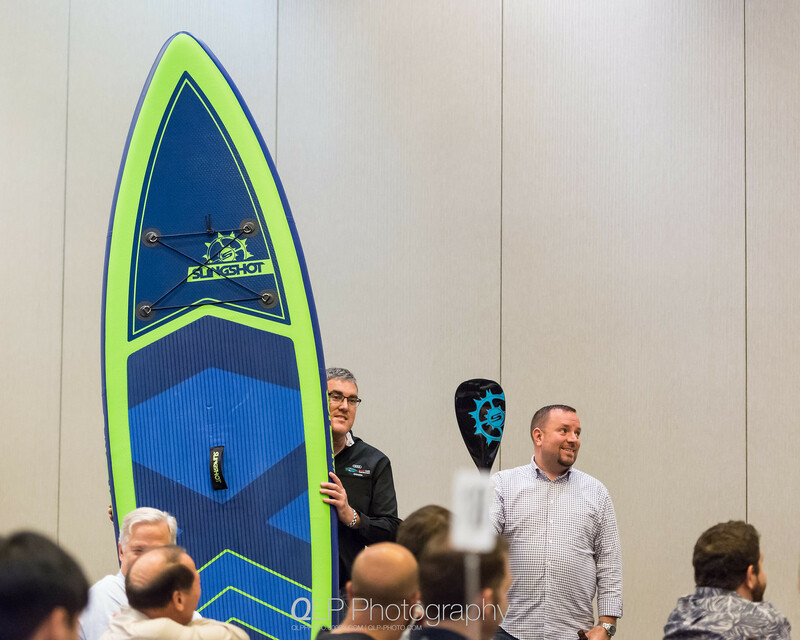 Afterwards, the banquet turned its attention to the auctions in hand, which included auctioning of several big ticket items, including a wind board, early registration for extremely popular (and quickly sold out) club events, and certificates for goods and services provided by some of the sponsors. 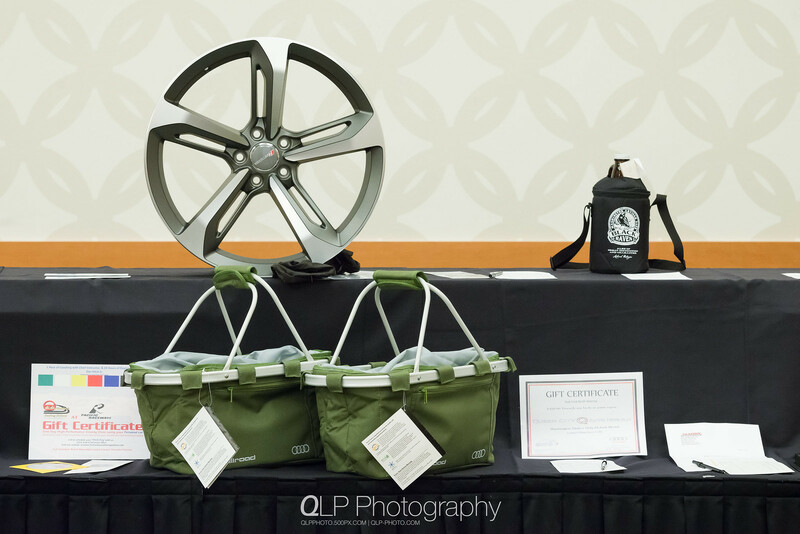 Towards the end of the banquet, the winners of the silent auctions were announced. 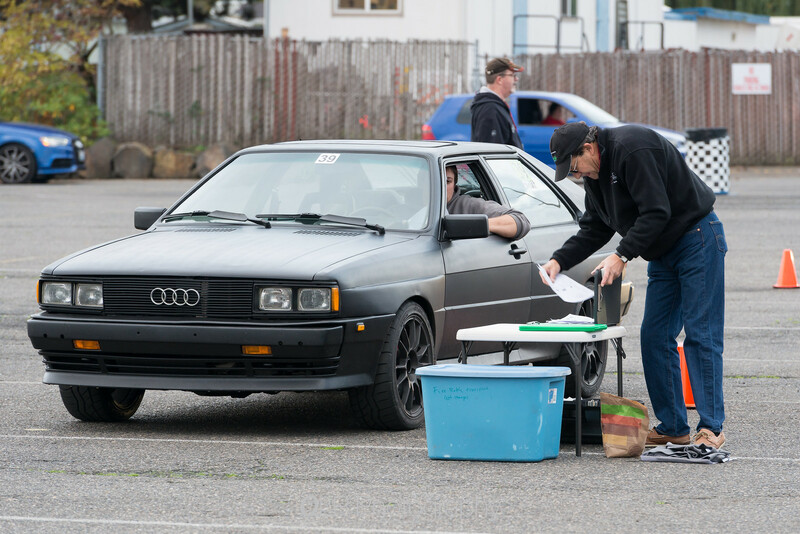 One of the silent auction items was an Audi Sport Carbon License Frame (Audi Collection price of $120) did not get too much attention and I was able to snag it for a very good price. Afterwards, I made my leave so that I can head home and get ready for the second day. By 7:00 AM on Sunday, made my way back out to PIR and started to wonder the paddocks and prep for another day of shooting. The weather in the first half of the day was miles better than on Saturday, with some sprinkles and drizzling here and there. As with Saturday, there was a drivers’s meeting to kick off the morning and participants of the auto-cross sessions making their way to the inner part of the track. Before the drivers’s meeting finished, I made my way back over to the flag station near corner #4 and set up to take photos of the first two run groups of the day (which I was covering from corner #12 on Saturday). 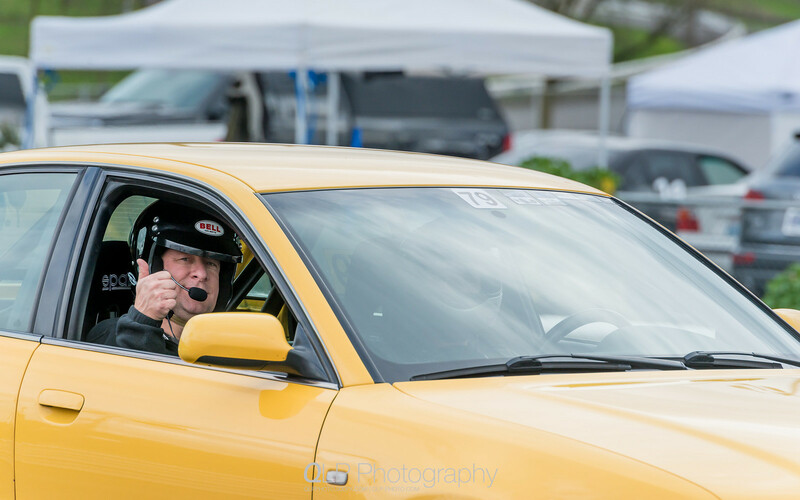 After the first two run groups were done, I made my way back to the staging grid and started to take photos of the staging grid. The weather after lunch started to make a turn for the worse and having already taken over three thousand photos, I decided to camp out in the Q5 and make sure that I had backups of all of the photos that I have taken and that I have everything ready to pack up. I got back out there for another quick shoot during a decent break in the rain. Right after 2:00 PM rolled around, the big, dark clouds started to blanket over PIR and having added another hundred or so photos, I decided to call it a day. 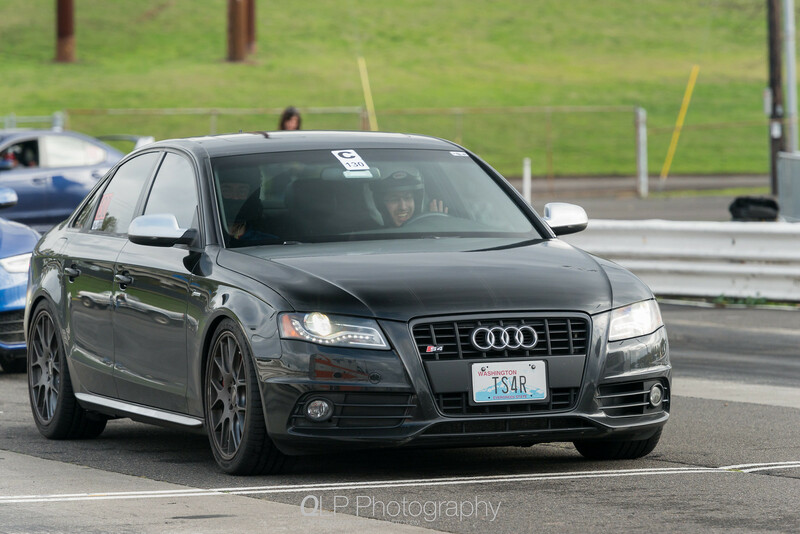 Speaking of the Q5, I am absolutely thankful that I had it as a photography support vehicle. Although it’s not the first time I’ve had one as a support vehicle, it was still a really nice car to get into with tons of room to lay out my equipment; not to mention, have a place that I can work on my laptop to copy photos between memory cards to several hard drives. 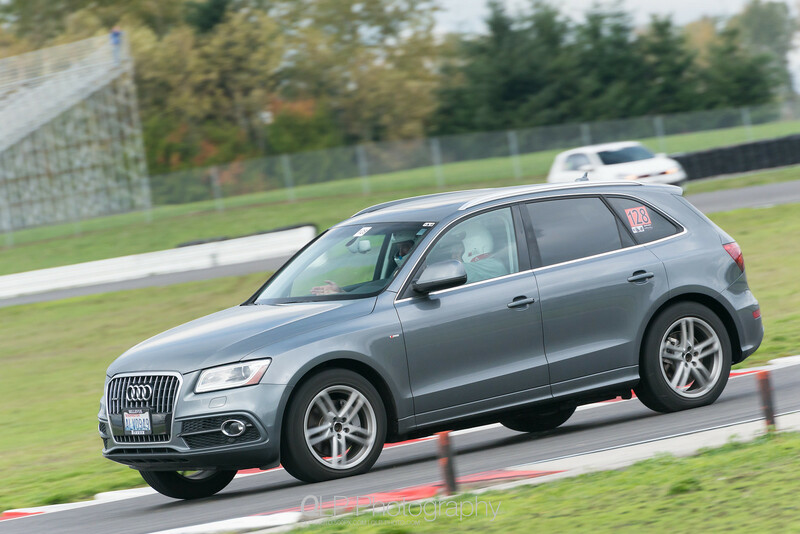 I wouldn’t have the Q5 if it weren’t for Scott Mitchell and Chris Aldworth, Fixed Operations Director, at Audi Wilsonville. As I touched on earlier, Audi has experienced a very long run of sales growth (58 months of record breaking sales) and expects sales to continue to grow. 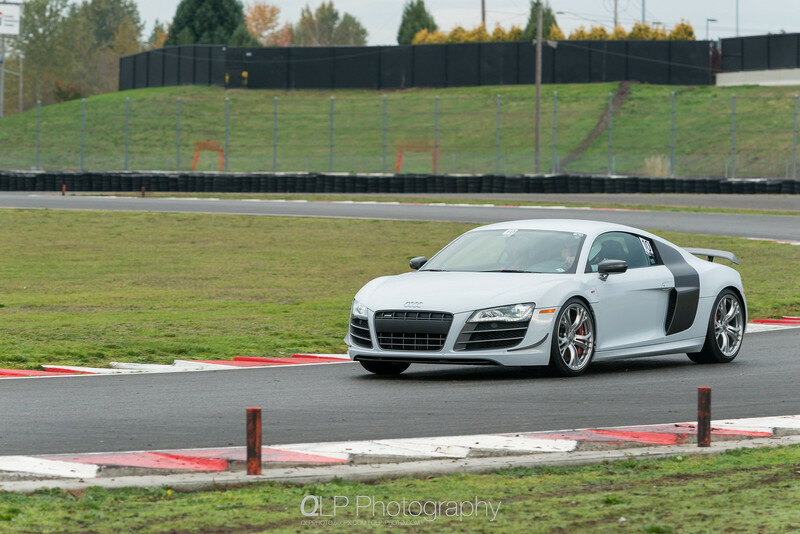 With that, dealers like Audi Wilsonville will have to expand to meet Audi’s growth and meet customer’s very high expectations when it comes to customer and vehicle service. 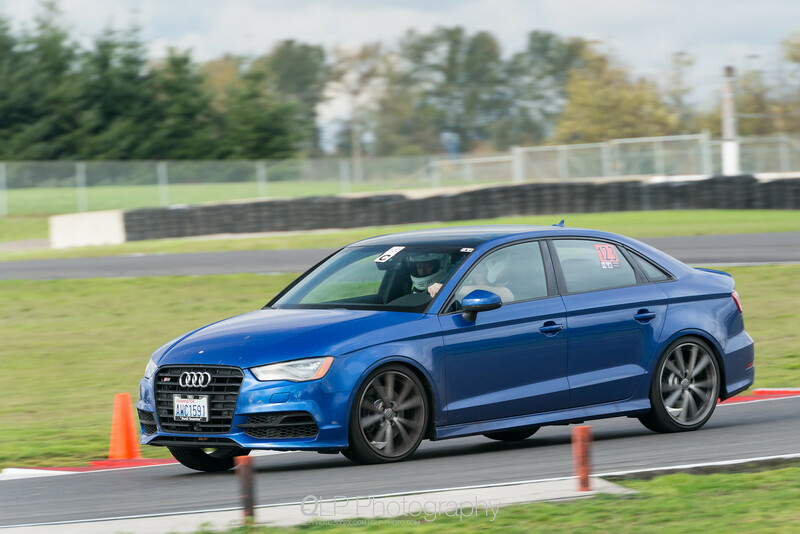 To do so, Audi Wilsonville will be expanding their already exceptional level of service (recipient of the Audi Elite Magna Society Award in 2013 and an Audi Magna Society Award in 2014) by adding 12 new dedicated technician stalls and 3 detail bays, which are on top of their existing 11 stalls. Completion of the service expansion is slated for February 2016. As always, I am always grateful for all of their material support, including providing me with vehicles for use as photography support vehicles, to allow me to cover events like Quattrofest. I will be working on processing and uploading additional photos over the next few weeks. For those interested in purchasing a digital copy of any of the photos on Flickr, please use the Contact Me form and include the title of the photo (D8E_XXXX) you are interested in purchasing. I would also like to thank Audi Club Northwest for giving me the opportunity to cover Quattrofest for a third year, and I cannot wait for next year!